Kathmandu day hiking, the capital city of Nepal, is vibrant with different historical and holy places. Out of 10 world heritages of Nepal listed by UNESCO, seven are located in Kathmandu Valley. The artistic house, palaces of ancient kings, temples, monasteries, stupas, and pagodas is what make Kathmandu Valley different from other. Our Kathmandu day hiking is perfect for those who are looking for a taste of short hiking trips in Nepal. Kathmandu is surrounded by a chain of the mountain and green hills with terraced farms, picturesque villages and lush green forests which offer you a lovely view during hiking. Hiking around Kathmandu provides you the opportunity to see Nepali rural life as well as excellent mountain views without going too far and without climbing high. You will get a chance to travel to a modest place, observing nature, rural communities, and spectacular mountain panoramas. Hiking and walking around Kathmandu valley route is comfortable full settlements of the traditional people as this area is not still affected by modernization. Time: 8 / 9 am. • Three prominent peaks Langtang Lirung, Ganesh Himal and Manaslu. • Pine forests, Rhododendron trees, and various wildflowers. The hike starts from Chapagaun VDC in Patan which is about 3 hours walking through the paddy field and the suburban villages. The highest point of this hike that we reach is 1550m from where we can view Kathmandu valley and three majestic peaks (Langtang Lirung, Ganesh Himal, and Manaslu). The incredible thing about this hike is the trail through the village of Tamang’s with traditional lifestyle and walking 70% through the pine forests with rhododendron trees and other wildflowers. 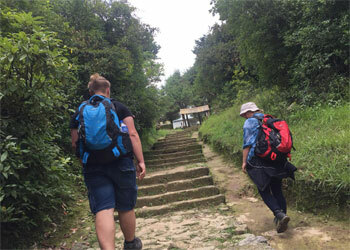 The trail eventually ends at the Botanical garden in the Godavari where you will get the chance to explore the garden and observe the different rare species of plants and flowers in Nepal. There is a forest above the garden which is famous for bird watching. With the hiking, you can enjoy the whole day in the garden. • Magnificent view of the Himalayan ranges, especially Langtang and Annapurna. A 2300 meters high peak, Champadevi acts as the border in the southeastern corner of the valley separating it from the Makwanpur district. Besides the hiking experience, this hill has a Buddhist stupa, and people visit this place mainly on the day of the full moon to pay homage to the lord. This day hike starts from a place called Pharping which lies 16 Km south of the Kathmandu From here we hike up following the trail, covered by pine forest for about another 3 hours to Champadevi. The hilltop offers a magnificent view of the Himalayan ranges, especially Langtang and Annapurna. After Lunch and strolling around for some time, we hike down following the same trail for about 1 and half hours. Phulchoki is the highest hill surrounding Kathmandu valley with an altitude of 2750m from Sea level. After our breakfast, we drive for about 45 minutes up to 14kms from the hotel to the place called Godavari (Botanical Garden) with packed lunch Box. From the Godavari, we start our hiking gradually uphill all the way through the sub-tropical thick forest for about hours. The magnificent view from eastern part of Annapurna range to Gaurishanker in the east can be seen from here on a bright day apart from the breathtaking view of Kathmandu valley. After lunch and strolling around for some time, we hike down following the same trail to the Godavari for about 2 and half Hours. • Oak, rhododendron and pine forest. This exciting hike through oak, rhododendron and pine forest starts with a drive to Kakani (2073m), an hour’s drive 32 km north of Kathmandu. The trail leads towards the east with a graveled road, almost flat path, and picnic spots. We will hike for about three hours to Bhanjyang, 20 minutes steep climb before we reach Bhanjyang. After lunch, we will stroll around for some time and hike down to Kakani for about two and a half hours and drive back to Kathmandu. • A holy site for the Buddhist. • Ancient Newar town Panauti. Namobuddha lies in the kavre district at an altitude of 1800m, about 38 km east of Kathmandu. The shrines and stupa made in this lovely little hill give a significant mark to an ancient holy site where a legendary prince named Mahasattva offered him to starving Tigress with its several cubs. This legendary episode is depicted in a very lovely stone slab and place right next to a holy stupa. The hike starts after we drive 35 km east of Kathmandu for about one and half hours to a place called Dhapasi via an ancient Newar town Panauti with packed lunch Box. From Dhapasi we follow the uphill trail towards north-east direction and the trail narrows. We cross a suspension bridge and pass Through many small villages to large rice field which gives you a chance to see how Nepali people plant and harvest the crop (during appropriate season). From here we hike steep uphill for about an hour to reach Namobuddha and the total hiking hours in % hours. After lunch and strolling around for some time, we drive down to Dhulikhel from about 30 minutes and one hour. • More than 500 species of vegetation. Shivapuri situated at an altitude of the 2563m north of Kathmandu is second highest hill around Kathmandu valley, after the famous Phulchowki hill. In this hill is located the Bagdwar, source of Holy River Baghmati and is the most significant water supply to the Kathmandu valleys increasing the population. We drive for about 45 minutes to Budhanilkantha Temple, one of the temples with the most prominent statue of Lord Vishnu sleeping in the ocean bed which lies 8 km north of Kathmandu. From Budhanilkantha we walk through Shivapuri conservation area where we can find over 500 species of vegetation. We start our hike from the southern boundary of the area where the army check post is located. Nagi Gumpa situated at an altitude of 2330m north of Kathmandu and above Budhanilkantha Temple is only Monastery for the Nuns where about 200 Nuns practice Buddhism and foreigners often come there for meditation. It is a steep uphill hike through the narrow and dusty trail for about half an hour and two hours gradual upward path to Shivapuri. After lunch and strolling around from sometimes, we take a shortcut downhill trail to Budhanilkantha for about and half hours and drive back to Kathmandu.